Great tasting sauces sold at low prices. All transactions are secure and fast shipping is guaranteed. Wholesale pricing available. Our sauces are fully prepared and are ready for use right out of the bottle. Whether you call them chicken wings, buffalo wings, hot wings or wings. 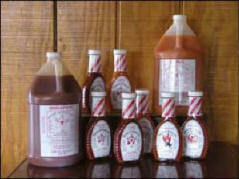 Alliger's House of Wings Sauce make them a mouth watering favorite. We bottle 9 of our 25 famous sauces, and from those 9 you can make an additional 11 flavors. In all, you will be able to offer your customers 20 unique flavors to enjoy. Wholesale pricing available for restaurants, bars and retailers.